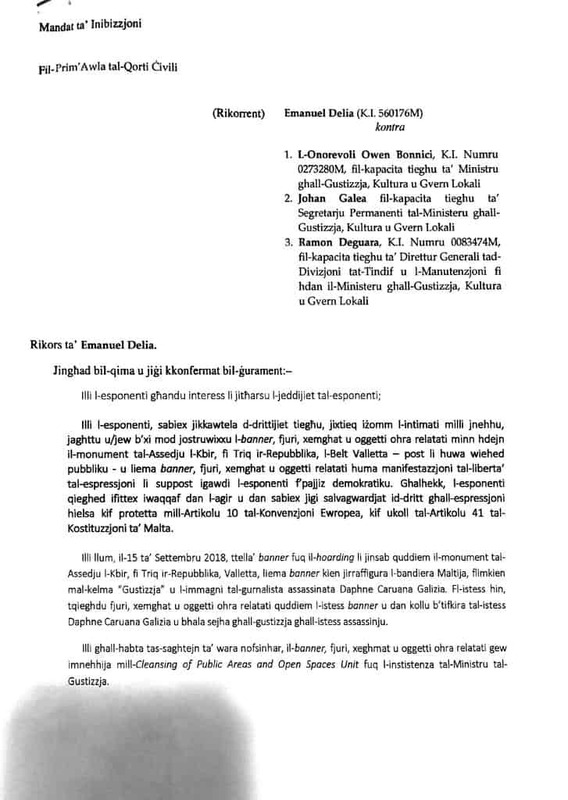 This evening, with the help of lawyers Jason Azzopardi, Karol Aquilina, Eve Borg Costanzi and Therese Comodini Cachia as well 61 other lawyers, I asked the court to open out of hours to consider my request to order the government not to remove the protest memorial in Great Siege Square. 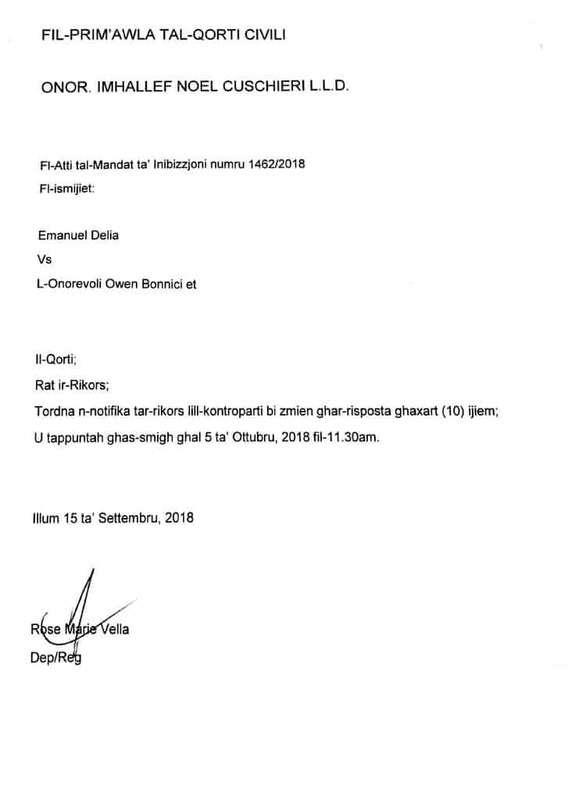 Judge Noel Cuschieri received my request and ordered the government to reply within 10 days ahead of a hearing on 5th October 2018. I asked the judge for something else which I was very much hoping for: to order the government not to remove the protest memorial until the case is properly heard and a decision can be taken on its merits. After 11 months of having to place back the memorial every time it was wiped out, I asked, on behalf of my activist friends, for the protection of the court. 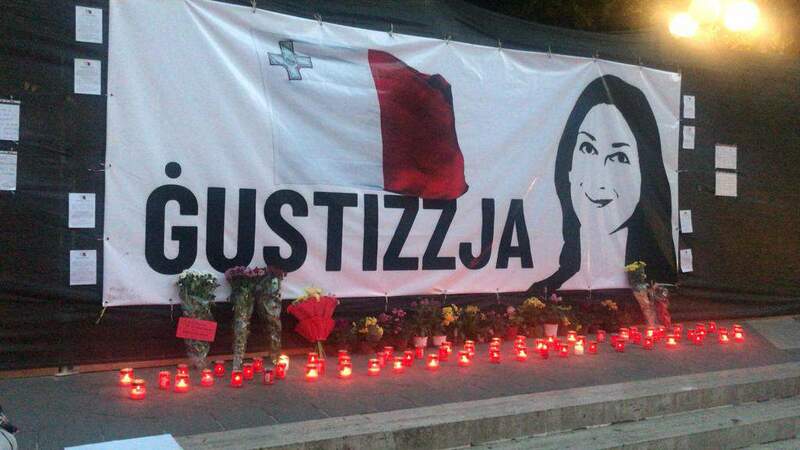 I could only do so today because for the first time ever the destroyers of the memorial demanding truth and justice for Daphne Caruana Galizia and for the entire country have shown their face. They did so because someone caught them with a camera today wearing the uniform of the Department of Public Cleansing. Confronted with the evidence they admitted they were the ones to remove the banner, flowers and candles and said they were acting under orders from officials in the Justice Ministry. And, in the presence of the police, and faced by the prospect of being accused of theft, they returned the removed banner, flowers and candles. Now, for the first time ever, we have a formal admission that the destruction of the protest memorial has been and is the action of the government. The judge did not provide a temporary injunction until the case is heard. It will be up to us, with our meagre resources and the time that we can give as volunteers, to continue to protect it until our arguments are heard. This was a disappointment. But it was not a loss. Now the government is obliged to state in court whether it intends to remove the protest memorial and will have to give reasons for doing so. Presumably, it will be hard for it to argue it’s doing so to “protect” the plywood hoarding. I filed the case in my name because it has to be in someone’s name. There has to be a person claiming their rights are being breached. But clearly, this is not just my story. Nor is it the rights of activists we are protecting. This is about everyone’s right to protest about anything they wish to exercise that right in the protection of. 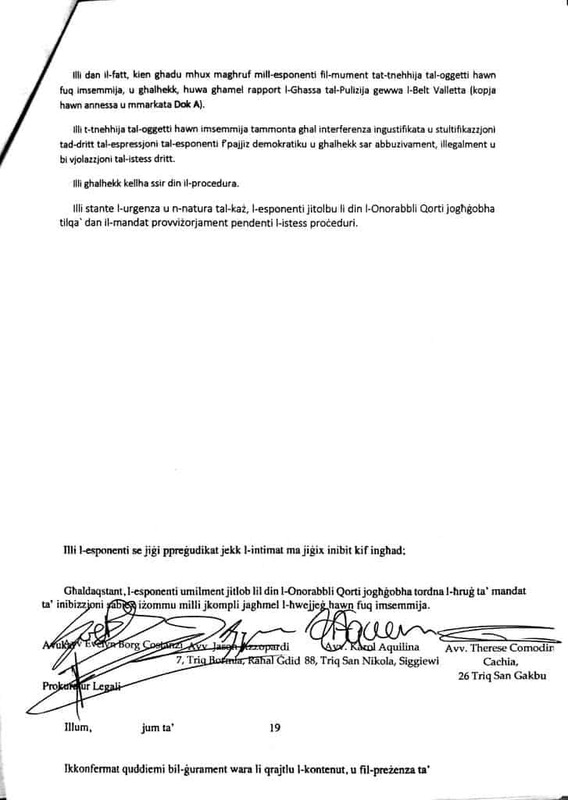 I wish to thank Jason Azzopardi, Karol Aquilina, Eve Borg Costanzi, Therese Comodini Cachia, Michael Agius, Samuel Azzopardi, Reuben Balzan, Kris Borg, Andrew Borg Cardona, Paul Borg Olivier, Thomas Bugeja, Kris Busietta, Simon Busuttil, Daniel Buttigieg, Noel Buttigieg Scicluna, Alexandra Camilleri, Peter Caruana Galizia, Anthony Cutajar, Edward Debono, Trevor Degiorgio, Mario Demarco, Alistair Facciol, Martina Farrugia, Beppe Fenech Adami, Raphael Fenech Adami, Ann Fenech, Mark Fenech, Michela Fenech, Peter Fenech, Bernard Galea, Vince Galea, Simon Galea Testaferrata, Austin Gatt, Gege Gatt, Antonio Ghio, Joe Giglio, David Gonzi, Lawrence Gonzi, Paul Gonzi, Karl Grech, Kenneth Grima, Peter Grima, David Griscti, Philip Manduca, Stefan Meilak, Angelo Micallef, Paula Mifsud Bonnici, Roberto Montalto, Karl Micallef, Malcolm Mifsud, Antoine Naudi, Georg Sapiano, Alex Perici Calscione, Anika Psaila Savona, Katia Psaila Savona, Chris Said, Nicolette Spiteri Bailey, Roberta Tedesco Metsola, Robert Thake, Stephen Thake, Louise Pulis, Aldo Vella, Francis Zammit Dimech, Joe Zammit Maempel and Michael Zammit Maempel for representing me in this case— and through me all civil society activists working in this cause.